The state Commissioner for Health, Dr. Jide Idris, made this known at a news conference in Lagos. “First at our Accident and Emergency Centre at the Toll Gate, Trauma and Burns Centre, Gbagada General Hospital and the Lagos State University Teaching Hospital, Ikeja. “Right now, we have only five left and they are being treated. Nobody received any money to treat them. They were treated free of charge. “So far, we are aware of only two of the hospitals and one of the victims has died,’’ the commissioner said. 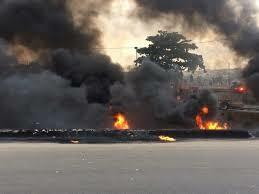 Idris said that two patients — a 48-year-old and 42-year-old, both males — were taken to the Burns and Plastic Unit, LASUTH. He said that one of the two males has been discharged, while the other was stable and responding to treatment. 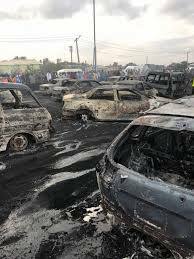 “While commiserating with the families of the victims who lost their lives and property in the unfortunate fatal explosion, I wish to state that the state government has left no stones unturned. “The government will continue to do the needful in addressing and managing all the issues surrounding the inferno,” he said. 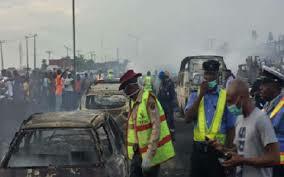 Also, the General Manager, Lagos State Emergency Management Authority, Mr. Adeshina Tiamiyu, said that the state government had commissioned the ministry to conduct a DNA analysis of the remains of those burnt to death. Tiamiyu said: “Not everybody is required to go for the samples; samples will be taken from one of the relations of the victims, including the father or the mother, child of the victims, siblings or an uncle or aunt. “When these are matched, we will be able to determine who the bodies represent and after this, we will hand them over to the families of the victims. Tiamiyu said that LASEMA had opened a help desk to help counsel victims’ relations.